For our summer event this year we were faced with yet another challenge. This time we asked ourselves how we could all work against our boss without him noticing. 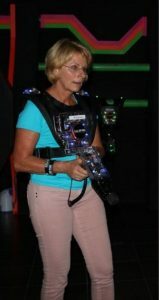 For this purpose we all came together at the Call of Fun centre in Friedrichshafen to do some laser tagging. After a quick instruction and having put on our vests we were ready for battle. The centre was as big as 750qm and thus offered lots of opportunities to hide, ambush or go for a frontal attack. We played for three rounds of 15min, which sound short but proved to be very exhausting. We did lots of laughing – and quite a bit of swearing too, when things didn’t go our way – but in the end we were all agreed that it was worth it. At the end we all met for a relaxing dinner at an Italian restaurant. We had a very good time with some very delicious food and it was an excellent opportunity for our employees to meet and to get to know new faces. All in all it was a very successful afternoon that everyone could enjoy. Our team is attentively listening to the instructions. Carmen just before the game started.